Saturday 2nd September I’m cycling the UK’s biggest climb Bealach na Bà raising money for the MS Society. 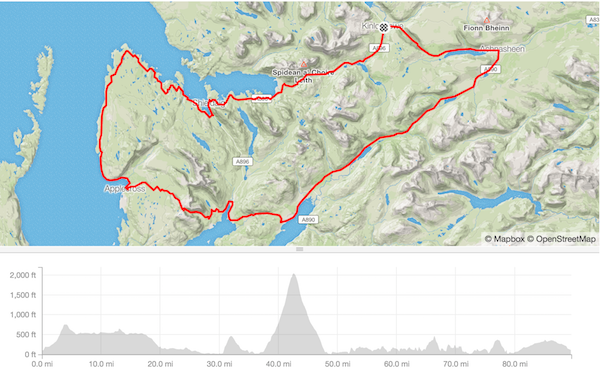 And all being well on Sunday 3rd, I’ll cycle it in the opposite direction - Bealach both ways! Bealach na Bà is the UK’s biggest climb at 2,053ft. It achieves that in around 6 miles from Tornapress to Applecross in the Scottish Highlands. In the opposite direction it’s almost as brutal with similar elevation in 5 pain-filled miles from Applecross. I’m participating in the cycling sportive, Bealach Mor, which is the Saturday and starts in Kinlochewe, It covers 90 miles with the Bealach featuring just before half way. On the Sunday I’m planning a solo 47 mile route from the cottage we’re staying in which hits the north side of the Bealach after 34 miles. I started cycling a couple of years ago, and after completing my first sportives last year I was looking for a challenge to target in 2017. I originally planned to do the Tour of the Highlands in May, but three weeks before I came off the bike and managed to break my collarbone which put a hold on that, and a hold on my cycling for a few weeks. I deferred my entry to Tour of the Highlands and will complete it in 2018. 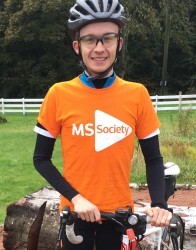 I have a family connection to multiple sclerosis, which is my motivation for raising funds for the MS Society, please donate if you can. Bealach Mor is an annual cycling sportive run by Hands on Events. A couple of hundred like-minded two-wheel enthusiasts head for a remote part of the Highlands to takle the UK's biggest climb. 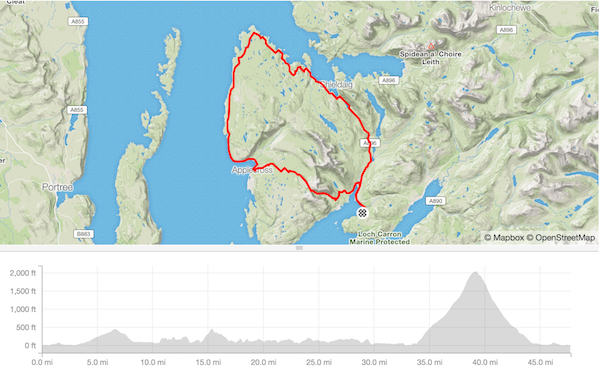 It starts in Kinlochewe and navigates clockwise, Achnasheen, Lochcarron, Applecross, Shieldaig and back to Kinlochewe. This year it's on Saturday 2nd September. On Sunday 3rd September, weather permitting, I'm planning on a solo route to takle the Bealach from the other direction. 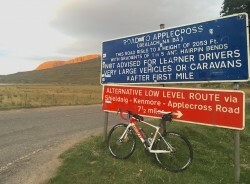 Bealach Mor was successfully navigated yesterday, and the Bealach na Bà climb both ways this morning. Video of the main event, and blog post. I successfully (this time) got round my last event before the Bealach today - Tour of Tweeddale in the Scottish Borders. It was a good one with some good climbs to test the legs on. Big ride alert! 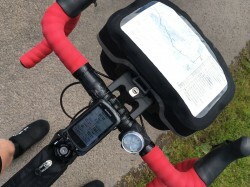 I pushed my longest ride to 254 miles in the Southern Uplands Audax. Starting at 6am from Musselburgh it was a 400km mammoth, and I finished just before 1am the next morning having completed my first hours of darkness. Full details here. So, it was the last event before the big one, and what did I do 50 miles in? Ran out of talent, hit the deck and broke my collarbone. Unfortunately that meant I had to postpone the Tour of the Highlands to 2018, but I have selected Bealach Mor in September as it's replacement. I kicked this off with a ride in the shape of the letters MS - 103 miles this time I thought 200 miles would be good. A couple of friends and I headed out on 15th April for an incredible day in the saddle. Full details here. I’d had my eye on Audax for a little while now, and spotted the Forth & Tay 200km event on the calendar. A bit different to other events that I’ve done it is much more self-sufficient, relaxed and the first I’ve done with controls (where you need to get some proof of passage at a location). Start and finish in South Queensferry, then Dollar, Auchterarder, Tayport, St Andrews and Falkland - so a mix of familiar and unfamiliar roads. The weather was great. The 130 miles was completed in around 10 hours 30 mins, and plenty of cake was eaten! Full writeup and photos here. A bit of something different over the winter, I entered my first duathlon, the Angus Bike Chain Monikie Winter Series. 4km run, 21km bike, 4km run was the format. I hadn't done much running, and was niggled by slight injuries by trying to pick it up quickly, that said it was a lot of fun and I'll definitely be entering again next year. In the end I placed 17th from 55 with a total time of 3:32:06. I started cycling in 2015, and completed my first sportive events last year (Etape Caledonia, Tour o the Borders). My longest ride to date was a jaunt to Glen Clova, 130 miles, but mostly my riding is the 34 mile round trip commute from St Andrews to Dundee. With a little inspiration I decided to do a route in the shape of a big "MS". Completing this in October the challenge is now on. You can follow my progress on this page, my JustGiving page (please donate :), or by following me on Strava or Twitter. Just training for this will be a challenge, with some big miles, and big climbs to be done. Tour of the Highlands is going to be one of the biggest challenges I've faced on the bike, and with your support raising funds for the MS Society will give me the extra strength to crest the final punishing climbs. MS is the most common progressive neurological condition affecting young adults, with diagnosis generally between the ages of 20 and 40. MS is the result of damage to the myelin - a protective sheath surrounding nerve fibres of the central nervous system. When myelin is damaged this interferes with messages from the brain and other parts of the body causing a wide range of symptoms including fatigue, mobility issues and problems with co-ordination. Please help me in helping them to raise funds for this worthy cause. JustGiving page for donations and more details. Strava profile to follow my training and all rides and runs.